Buying and Owning a Cat Thats Right For YOU! Many people find themselves toying with the idea of getting a pet and decide to set their sights on a cat. The cat might be for themselves, for a loved one, a friend, or for children. For those who have never owned a cat before, this can be quite a tricky venture. Buying a cat is not as simple as pointing your finger at a cat in the store and saying that you want that one. Unfortunately many people adopt this method of getting a cat and later find that the cat does not fit into their lifestyle for a variety of reasons. This is why a certain amount of research needs to be done before you decide on what kind of cat that you want and if you want to start out with a kitten or an adult cat. By reading this book you will be provided with the questions that you need to ask yourself in order to decide on what cat is right for you. Not all cats are the same. Different breeds of cats mean different physical features, different personality trains, and different behaviors. If you are gone from home quite a bit, you dont want to get a cat that craves its owners attention all of the time. On the flip side, if you are looking for a cat that you can snuggle up to while watching television, you dont want to pick out a cat just to find that they could not care less about being lovey dovey with you. This book will help you to find just the right fit so that both you and your cat are happy. Having a pet can be a wonderful thing when you two connect. Once you have your feline friend there are sure to be an abundance of questions regarding their feeding habits, grooming, health, vaccinations, and what supplies you will need to have on hand. Even if you have had a cat before, there are sure to be tips and tricks in this book that will help you understand and deal with behaviors that your cat may be displaying. This book is basically the Cat 101 on buying and owning a cat, plus there is a helpful chapter that is full of dictionary terms so that you can understand what other cat owners and your veterinarian are talking about, the information in this book is priceless! One of the main reasons that animal shelters and rescue shelters are so packed with animals is because people take on more than they bargained for when they get a pet without doing the proper research on that particular breed beforehand. This book gives readers insight as to the common breeds of cat that many people find themselves quite happy with, and what criteria should determine what kind of feline companion that you should be looking for. Without this information you are taking a risk at getting a cat that you are not happy with and sending it to a pet shelter or being stuck with that cat for the rest of its life because you are too guilty to get rid of it. This doesnt have to be your reality, this book offers you all the information you need in order to determine what type of cat is going to work best with you. It also contains chapters of useful information that will help you care for your cat after your decide what you want. Why spend hours searching all over the internet or through dozens of books when you can find all the information that you are looking for in one resource. Once you have read the book and decided on what type or breed of cat to get, you will find all the information that you need on how to become prepared for your new addition to your home. In reality, buying a pet of any kind is a major purchase because it is not only affecting your life but also the life of that cat. This book will help you to know what items are necessary for your cat to feel comfortable in its new home, how to feed your new cat, and how to deal with many of its behaviors. Many who decide to buy a kitten find themselves completely unprepared once they get them home, this book will help to prepare you in advance so that you will be able to transition smoothly as your kitten grows into a full grown, adult cat. There is a wealth of information in this book that you will be able to refer to in years to come. There is information on feeding habits for your feline, how to groom your cat, how to travel with your cat, how to understand your cat, and how to discipline your cat. Whats really great is that each chapter contains many tricks and suggestions that might make life a little easier for you and your cat, especially if this is the first time you have ever owned a pet of the feline persuasion. Doing research before bringing and animal home is a smart idea; this book has done all the work for you buy combining a variety of topics all into one resource. Dont waste your time searching for answers to your cat questions when you can find everything you need within this one book. 1)Learn how to decide what cat is going to be the best choice for you or whoever the cat is being bought for. Dont join the thousands of people that end up giving their cat back to the pet store, pawing it off on a friend, or turning it over to the local pet shelter because they are not what you thought they would be. This book shows you what to look for in a cat. 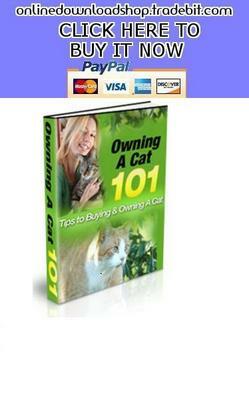 2) Invaluable information for after your decide to buy a cat. It is so easy to walk into a pet store and begin to buy one of everything for your new feline companion. This book shows readers what they will need for your new addition without spending a fortune buying the items that are not necessary. You will learn what to feed your cat, how to feed your cat, how to groom your cat, how to discipline your cat, how to travel with your cat, how to understand those quirky behaviors that your cat may demonstrate, and how to keep your cat healthy. You can have all the information in one neat package for only $1.99! Make Your Own Cat With Plr - Hot Item!! !